"Make the studio space beautiful, a place that nourishes the spirit and senses. If you have the resources, store paint in clear jars to bring vibrant color into the room. Bring lush green plants into the space. Pour glitter into glass jars and set them on the window ledge to sparkle in the sun. Arrange shells, rocks, or branches on shelves, or hang them on the wall. Tuck unexpected treasures into the studio; a vase of feathers, a basket of sea glass, or an abandoned bird's nest. Store paintbrushes in pottery jars. Create a space that stirs the imagination and awakens the senses." Our children love art. 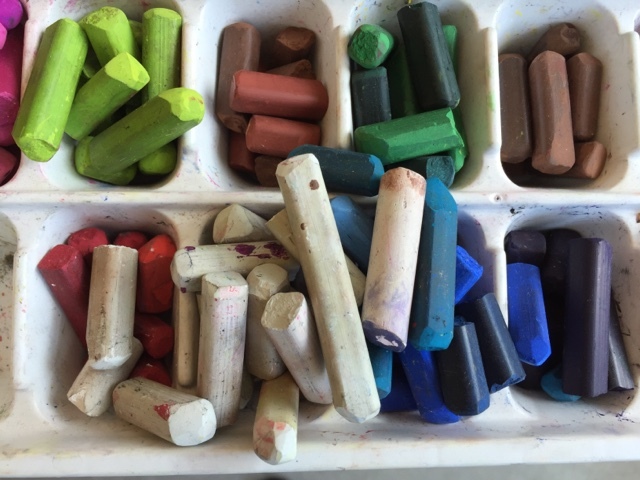 The art studio is one of the most popular centres visited during free play and often the first children look to upon their entry to the classroom. They are curious to see what new invitation has been displayed and eager to explore the new tools and materials that have been added to the art shelves. 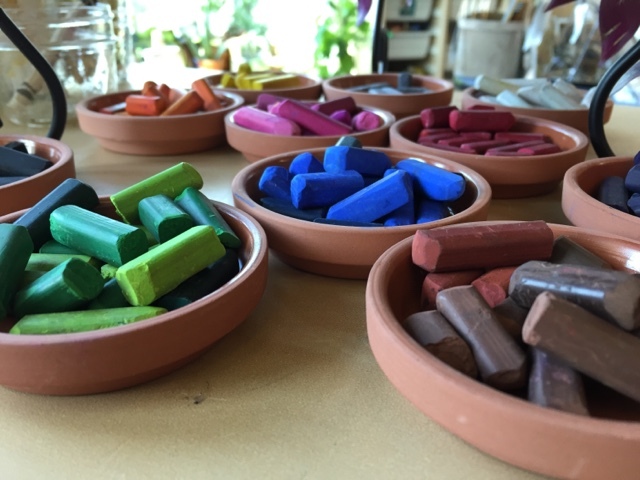 This week we purchased some mini terracotta saucers for use with our watercolour paint pucks. The earthy colour and cool texture made it a perfect fit with the centre's neutral palette. We believe that art materials should be aesthetically displayed and accessible to children. When the beauty of the materials - the texture, size, shape and colour - are celebrated (instead of being hidden in a storage cupboard) and included as part of the classroom decor, children are inspired to use them in innovative ways to support their explorations and communicate their ideas and learning to others. 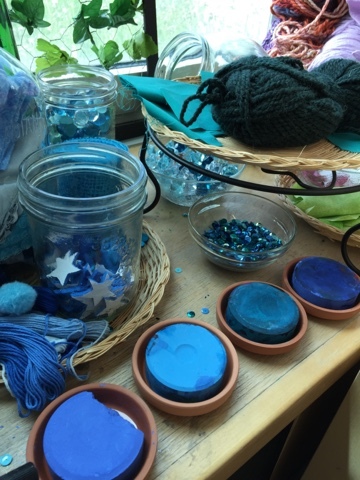 The art centre is a place where children feel inspired and welcomed! We honour children and their ideas through the use of meaningful, beautiful, accessible materials that celebrate them as learners with endless potential! 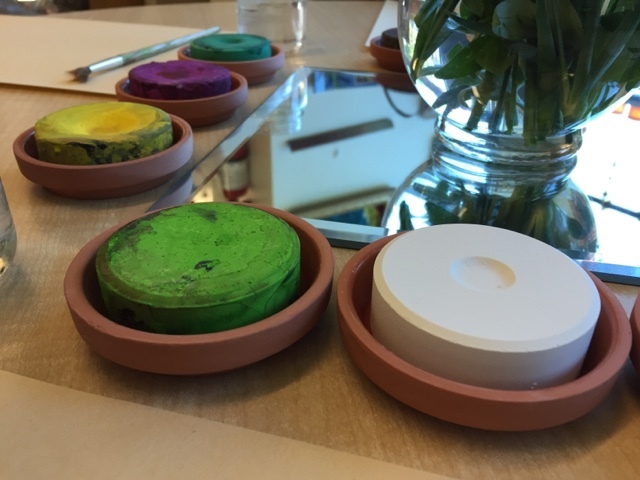 Our watercolour paint pucks challenged us for a while, which is why we were so excited to find the terracotta saucer solution! In the past we had tried using the traditional tray, but we didn't like how we were limited to the colours that were stuck in the tray. The children will often ask for specific colour combinations depending on what they are creating. In the previous photo you can see that the colours of paint displayed match the flowers in the vase. The tray did not offer this as a possibility with its fixed number of spots. The plastic also retained the colours of the paint and the stains and messy nature of the tray were uninspiring. We weren't satisfied with this solution. We've also tried displaying the pucks on a mirror, but that was also cumbersome. The paint would become stuck which made swapping out the colours for certain combinations depending on the provocation or experience very difficult. The glass mirror was also not easy to use when transporting materials outdoors. Plus the mirror just looks messy. 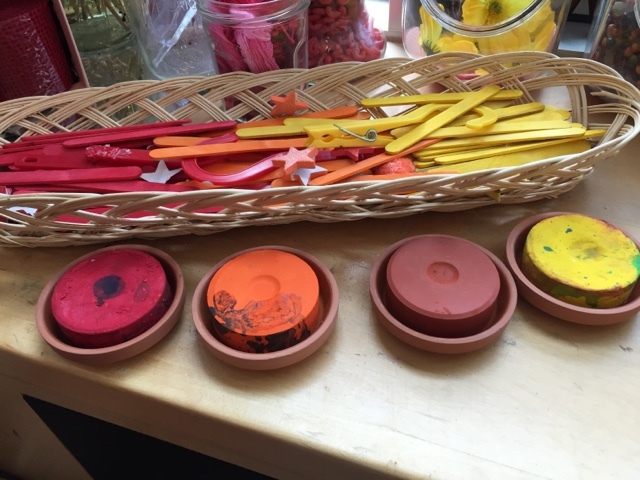 We believe that honouring children and their work means providing accessible and aesthetic tools and materials that value them as equal members in our learning community and sends the clear message that they and their ideas are essential for our collective understanding and growth. We used individual terracotta saucers. 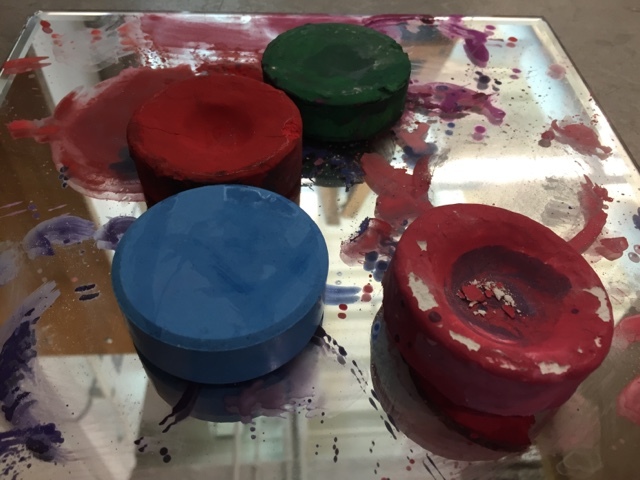 By separating each paint into its own container, the colours could be easily integrated into the display of materials available to the children on the art shelves. This means that we are displaying more shades and varieties of materials in our colour spectrum, and children are now able to access any paint colour they might need for a project. They do not need to ask an adult for assistance because the materials are freely available whenever they might be needed. 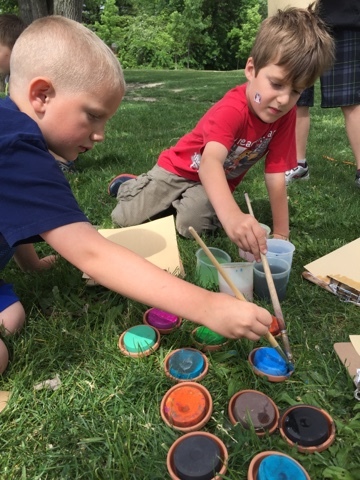 Engaging children in rich, meaningful, integrated artistic activities outdoors is an important part of our program. 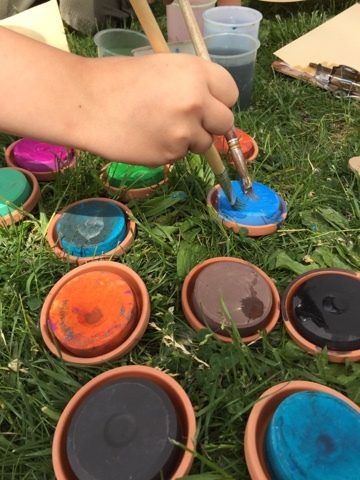 Now that the paint pucks are easy to transport, the children are able to self-select the ones they need for a project and independently use these outside. An added bonus? They look just as lovely when resting on a bed of grass too! We also examined how we displayed our various shades of pastels in the centre. Normally they are sorted by colour using a white ice cube tray. 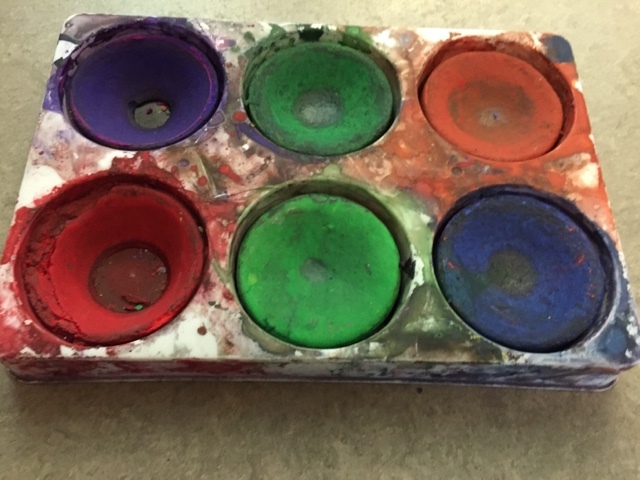 Like the watercolour tray, there are many easy to see stains and the materials aren't very inspiring or enticing. We reorganized the materials using the terracotta saucers and the pastels look just lovely sorted and displayed similarly to the paints! I love how beautiful and inviting these materials look! Can I ask a question - where did you find the watercolour paint pucks? I have been looking around online and can't seem to find them!